There are three subjects as Physics, Chemistry, and Biology which comes in General Science. All these three subjects are very very important and scoring for all competitive examinations like SSC, RRB, JSSC, BSSC, PSU, IES, NTPC, BHEL, IOCL etc. Only Basic questions ask in any exams. You have to clear only concepts of Physics, Chemistry, and Biology. Here, you will get complete syllabus of General Science for all exams. We will provide you basic to advanced MCQ or Objective Questions with the answer and explanation from all these three subjects. Because MCQ is asked in any exams. 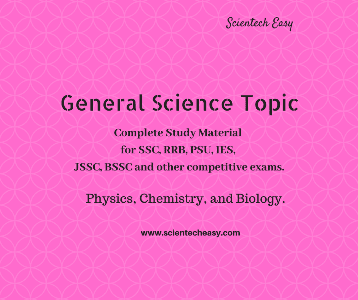 These study material would you to understand the basic syllabus and related questions form all topic of general science. Frankly speaking, You cannot qualify any competitive exams without preparation of these three subjects. S0, let's study MCQ of each topic one by one. 1.5 Structure of Plant and Animal Cell. 1.6 Classification of Plant Kingdom. 2.2 Mode of Nutrition in Plant. 2.4 Sexual Reproduction in Flowering Plant. 2.5 Asexual Reproduction in Plants. 2.6 Transport system in Plant. 2.7 Respiration and Excretion in plants. 2.8 The Cell: The foundation of all living things. 2.9 Cell: Structure and Functions. 3.0 Control and Coordination in Human. 3.2 Excretory system in Humans. 3.3 Respiratory system in Humans. ➝ Food & Nutrition MCQ-2: Proteins. 4.3 Classification of Animal Kingdom. 4.4 The five kingdoms of life. 4.5 Mode of Nutrition in Animal. 4.7 Sexual Reproduction in Animal. 1.3 Work, Energy, and Power. 3.7 The Human eye and Defects. 1.4 Periodic Classification of Element. 3.0 Concepts of pH scale. I hope this article will help you to understand the General Science Topic /syllabus for all exams. This syllabus is a basic and very important for all exams. We will provide you MCQ for each topic to make easy our exams. because MCQ is easy to remember and good for practice. Biology is more important. From the recent analysis, questions are asked more from biology subject. Biology must be strong to crack any PSU exams.